qEEGPro 7channel Z-Score Training for Freedom The qEEGPro Live Z-Score DLL provides a new standard in real-time qEEG-based neurofeedback. Among its innovative capabilities is the ability to define Z-Score target ranges individually for each client, so that you are not limited to predefined bands. 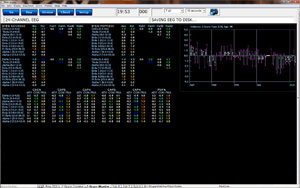 All qEEGPro DLL frequency parameters are computed on 1-Hz boundaries, (1-50Hz) so that any desired range can be visualized, imaged, or trained.